So you’ve heard about those who have sold their house and bought an RV to live in, right. These folks are known as Full Timers. I’m not knocking those people and sometimes I even envy them. I believe most of the people full timing are retired but there are quite a number of people we’ve met who are working full time and living in their RV. It seems that technology has made it easier to work from anywhere in the world if all you need is phone and internet access. There are many benefits and challenges to working on the road and I won’t get into them in this article. Just type “full time RV while working” in your favorite search engine and you can learn about it. This article is only about the reasons we don’t ever expect to be Full Timers. The mighty four are all retired and don’t have to worry about working while travelling. 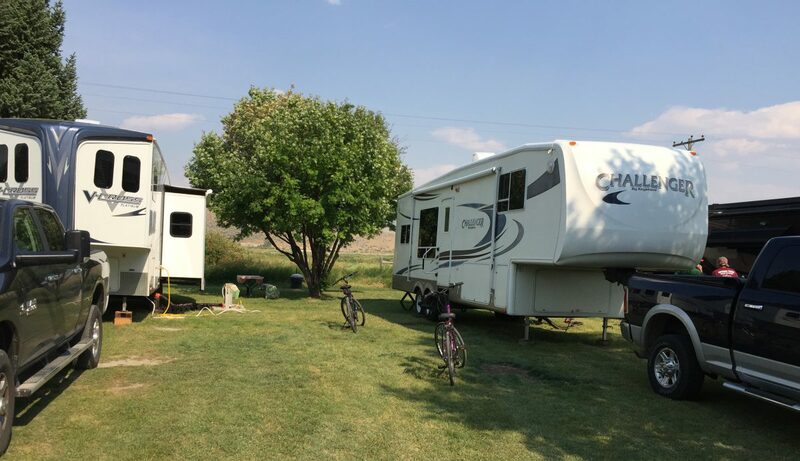 My wife and I have a beautiful modest home on three and a half acres in a wooded setting that could compete with many of the scenic areas we visit in our RV. I was just relaxing on the deck and watching the wild life while having a nice cold beverage today. I know you can relax and enjoy the outdoors anywhere, but there’s something special about seeing the wildlife on your own place. We feed the birds and have many varieties who come to visit. In addition to the birds who frequent the bird feeder, we see foxes, turkeys, red tailed hawks, coopers hawks, pileated woodpeckers, barred owls, white tailed deer, groundhogs, skunks, chipmunks, and of course, squirrels. I’m one who likes to putter in the yard. On three and a half acres you can do a lot of puttering. But the home and property of which we are caretakers in this short life are not the reason we don’t expect to be Full Timers. It’s those precious family members and friends we just need to spend time with as regularly as possible. We have three beautiful daughters, two fine son-in-laws, one daughter-in-law and three of the smartest and most outstanding granddaughters that ever existed. We might be a bit biased on that last point, but that’s the way I see it. Travelling the country in our RV is wonderful but we limit it to a month at a time so we can be back to see “the kids”. After all, when we leave this earth, everything we’ve seen and the experiences we’ve had will go with us. I believe we will leave a lasting mark on those family members we leave behind. I know my parents, in-laws and grandparents did that for me.